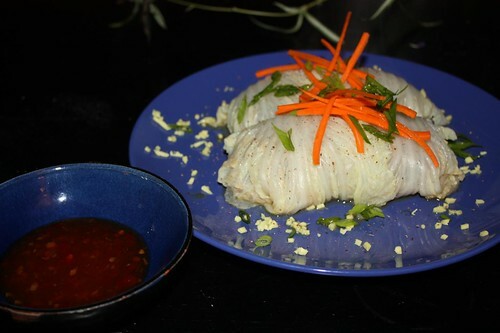 Last night I made Iron Chef Chen's fried rice and tonight I felt the need to expand on the Chinese Cabbage Battle episode by making some stuffed cabbage. I sauteed up some chopped garlic, ginger, and red chilies that we got from the farmer's market last week. Then I added some ground pork, Sichuan pepper, tamari, and a little rice wine vinegar. I cooled it slightly before adding some egg to the mixture along with a little of the turkey stock remaining from last week's Coq au Vin. After boiling some nappa cabbage leaves I cooled them, wrapped the mixture, and finished by steaming them. I topped them with chopped ginger, scallion, and sliced carrot. I also served some sweet chili sauce on the side even though it wasn't really necessary. I thought it better created the feel of an Iron Chef dish which are usually served with separate bowls for dipping sauces. 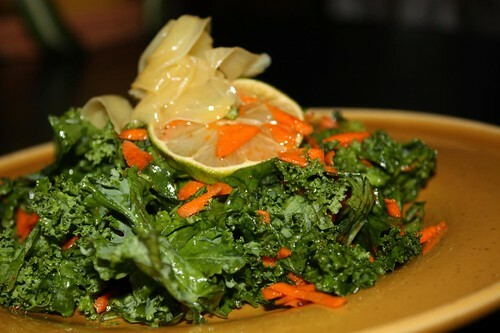 I also made a salad with kale, rice vinegar, sesame oil, lime slices, shredded carrot, Sichuan pepper, and pickled ginger. 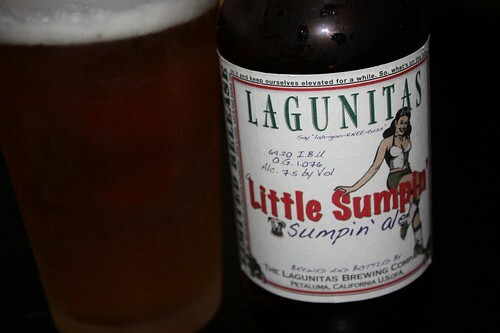 For a beverage I poured some Lagunitas Sumpin' Sumpin' Ale. At first sip I did not like this and by the end I really enjoyed it. I hate to be that guy to say that it has "notes of this or that" but it tasted shockingly like grapefruit. The aftertaste in particular made me feel as though I'd just taken a giant bite of the citrus fruit. This paired far better with the cabbage rolls than I thought it would. There is still a tremendous amount of nappa cabbage in the fridge. I really should have taken a photograph of the size of this head of nappa before I started using it. I've lost count but I must have used it in a half dozen dishes so far over the course of several weeks. My new technique of watching the appropriate Iron Chef episode to come up with ideas for how to use leftovers seems to be paying off well. In addition to reawakening my interest in Japanese (and more so Chinese) cooking it has helped me push a tremendous amount of food out of the fridge before it spoils. Not to mention that it's quite likely the greatest show that's ever been on television in any language, time, or country.